Gloria Steinem said that the truth will set you free, but first it will piss you off. Well, here’s some truth if you find your dishwasher is not cleaning the dishes properly. A lot of your problems don’t have anything to do with your appliance – they have to do with you. Before you get all huffy because you spent X-hundred amount of dollars on the darn thing, understand that little, tiny changes to the way you do things will improve the cleaning results of your dishwasher immensely. If you do nothing else differently,try this hack: just before you turn on your dishwasher, run your faucet until the water is steaming hot. Otherwise, the water pumped into your dishwasher will be cold from sitting in your copper pipes. This way, you start with steamy water that has the best chance of reaching the high temperatures necessary for cleaning and drying completely. Water needs to be heated to 140-degrees Fahrenheit to dissolve food messes and disinfect dishes. Despite what you might think, too much soap can actually prevent your dishes from getting clean — especially on the top rack. Use only half the amount of detergent recommended on the package. And if you have a water softener, you need only 1-2 teaspoons of powder — even less if you use liquid. I think these people may have used too much detergent. Too much soap causes over-sudsing. The dishwasher tries to drain as much of the soap suds and food residue as it can, but is unable to drain it all in the time allowed. Then the soap bubbles pop inside, redepositing tiny food particles back onto the dishes, which show up most on glassware and silverware. How do you know if you’re over-sudsing? Run a cycle without any soap. If suds are left at the bottom of the tub, you’re over-sudsing. You might have to repeat the process two or three times to ensure you’ve eliminated the buildup of soap. And don’t forget the rinse aid if your dishwasher isn’t drying! Let me know if it works for you. 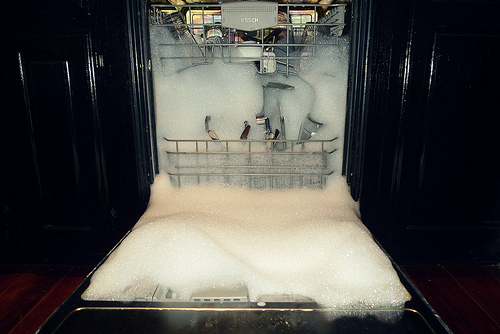 Obviously, some dishwashers are probably beyond saving, but depending on yours, my other top recommendations include using rinse aid, not rinsing your dishes before loading them and not using too much soap (they go hand in hand), and cleaning out your filter (found on the unit floor inside) and spray arms. I think the water tube/pipes going INTO my dishwasher are clogged with well-water sediment. Plumbers say it’s a dishwasher thing and dishwasher ppl say its a plumbing thing. Ideas? This is interesting because everybody should learn that proper cleaning of your dishwashers will save you time and money. You should make sure that your dishwater is hot and if you notice a drastic change, i would suggest you consult a plumber to avoid cold water.